Where do creative kids get their dreams? Some of them look at the skies. And maybe some of them learn about others’ dreams and go looking for their own. One of the gifts we can give young people is the lesson that they can look for the thing that inspires them. And one way to do that is by sharing stories of creative explorers. 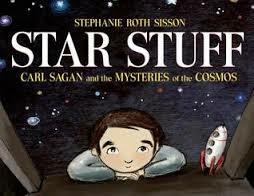 A book that fits the task is Stephanie Roth Sisson’s Star Stuff: Carl Sagan and the Mysteries of the Cosmos. Carl Sagan, who introduced a generation to the “billions and billions of stars” in the cosmos, started as a curious young boy with a big imagination. Sisson introduces us to the ways Sagan wondered about the world, the way he set out to study, and the way his imagination led him to projects that changed the way we understand the cosmos. Here’s a glimpse of Carl grown up. His wonder at the universe is still palpable. I love his joy in “the courage of our questions.” For students who might consider themselves too old for picture books, perhaps the video above can serve the same purpose. The story of Carl Sagan is a chance to talk to children about things they wonder about the stars, or about the other things that make them curious. Helping students envision themselves as questioners is one of the keys to supporting their creativity. This little book is one way to support that. PS Anyone remember why Sisson would have chosen Star Stuff as her book title? Sagan is famous for his quote, “We are made of star stuff.” Here, for you (and students a bit too old for Sisson’s picture book), is why. Chemistry teachers, this is for you! For more information on Sagan’s work, you might visit the Carl Sagan Portal or this article from Smithsonian.